To finish out the run of our world premiere of To Catch a Fish, we asked our actors to share their thoughts about the events in the play and their experiences with the show. 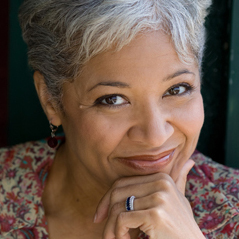 Today we finish out our series with Linda Bright Clay (Brenda Cameron), and her thoughts on love, vulnerability, and the intimacy of performing in TimeLine’s 99-seat space. To Catch A Fish is based on the story of Chauncey Wright, a man suffering from brain damage who was tricked into illegal activity by federal agents. You can read more about the history behind the play in our Backstory magazine. Playwright Brett Neveu creates a fictionalized account of Chauncey’s story using the character of Terry Kilbourn—who, like Chauncey, suffers from brain damage and is unknowingly tricked into illegal gun sales by ATF agents. She had to be tough, but it was a tough love. 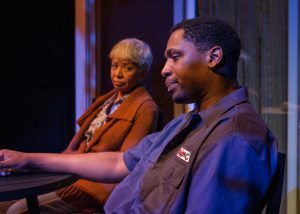 Brenda (Clay) and Dontre (Al’Jaleel McGhee) chat on the porch in TimeLine’s To Catch a Fish. Vulnerability is also a central force in the actors’ performances, as they use their own experiences to help fuel their character’s emotions and drive. A couple of years ago, Linda was driving in Oklahoma with family and friends when she was pulled over in a small town. “[We were] breaking no laws [and got] pulled over for questioning: were we lost, why were we there, etc. A classic example of DWB: Driving While Black.” Issues like this exemplifying systemic racism are also explored in To Catch A Fish—the agents’ attempts to catch illegal gun sales set up the play’s lower income individuals, many of whom are African American, for arrest.